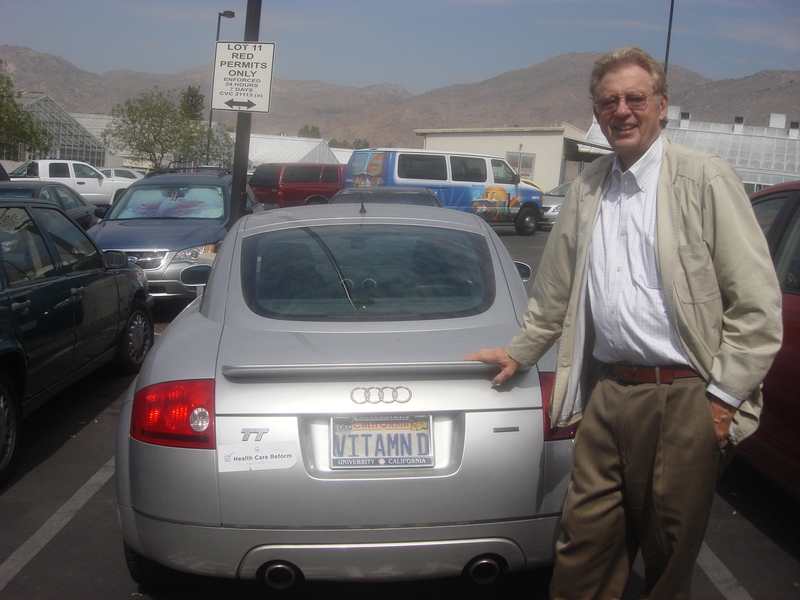 Anthony Norman, a distinguished professor emeritus of biochemistry and biomedical sciences at UC Riverside, has a car with a vanity license plate that reads "VITAMN D." Photo credit: Katherine Densmore. 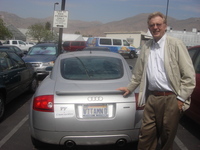 RIVERSIDE, Calif. – Anthony Norman, a leading international expert in vitamin D, proposes worldwide policy changes regarding people’s vitamin D daily intake amount in order to maximize the vitamin’s contribution to reducing the frequency of many diseases, including childhood rickets, adult osteomalacia, cancer, autoimmune type-1 diabetes, hypertension, cardiovascular disease, obesity and muscle weakness. Currently, the recommended daily intake of vitamin D in the United States is 200 international units (IU) for people up to 50 years old; 400 IU for people 51 to 70 years old; and 600 IU for people over 70 years old. Today there is a wide consensus among scientists that the relative daily intake of vitamin D should be increased to 2,000 to 4,000 IU for most adults. Reporting in a review paper in the July 28, 2010, issue of Experimental Biology and Medicine, Norman and Roger Bouillon of the Laboratory of Experimental Medicine and Endocrinology at the Katholieke Universiteit Leuven, Belgium, warn that if the current nutritional guidelines for vitamin D remain unchanged, rickets and osteomalacia, which could be easily prevented, will continue to occur. They add that if the present guidelines for vitamin D intake are strictly implemented and applied worldwide to pregnant or lactating women, newborns and children, the occurrence of rickets in infants could be effectively eradicated. Norman, the first author of the review paper, and Bouillon note that if the daily dietary intake of vitamin D is increased by 600-1000 IU in all adults above their present supply, it would bring beneficial effects on bone health in the elderly and on all major human diseases (e.g., cancer, cardiovascular, metabolic and immune diseases). The researchers add, however, that if the vitamin D dietary intake were increased to 2000 IU per day and even more for subgroups of the world population with the poorest vitamin D status, it could favorably impact multiple sclerosis, type-1 diabetes, tuberculosis, metabolic syndrome, cardiovascular risk factors and most cancers. Also known as the “sunshine vitamin,” vitamin D was discovered 90 years ago as a dietary agent that prevented the bone disease rickets. Exposure to the sun is the body’s natural way of producing the vitamin. Skin exposed to solar UVB radiation can produce significant quantities of vitamin D. But this vitamin D synthesis is reliably available year-round only at latitudes between 40 degrees north and 40 degrees south. A combination of sunshine, food, supplements, and possibly even limited tanning exposure can raise the daily intake of the vitamin to 2000 IU. Vitamin D is itself biologically inert. Its biological effects result only after it is metabolized first in the liver and then in the kidney – a process that converts the vitamin into a steroid hormone. The best sources of unfortified foods naturally containing vitamin D are animal products and fatty fish and liver extracts like salmon or sardines and cod liver oil. Vitamin D-fortified food sources in the United States (the fortification levels aim at about 400 IU per day) include milk and milk products, orange juice, breakfast cereals and bars, grain products, pastas, infant formulas and margarines. Vitamin D excess can cause health problems such as hypercalcemia, vomiting, thirst and tissue damage. The precise upper limit for daily vitamin D intake is not well defined.